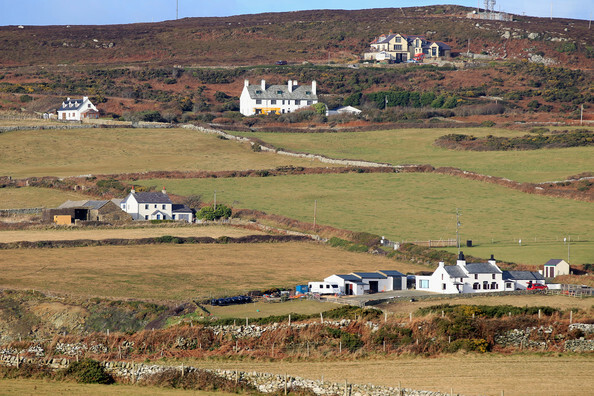 We are all familiar with William and Kate's Royal residence Kensington Palace but we know relatively little about their Welsh home Anglesey. 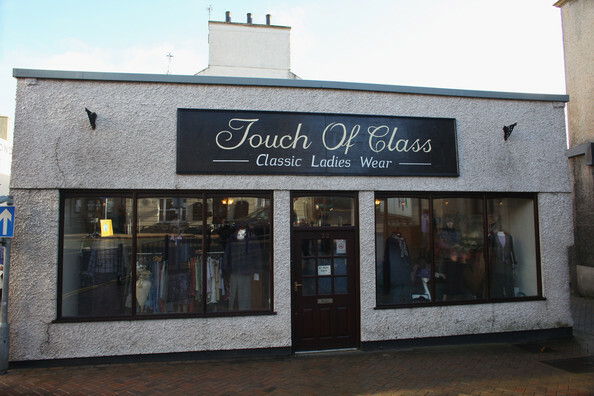 I thought we would remedy that with a post looking at the town and places William and Kate frequent. The isle of Anglesey is situated off the north - west coast of Wales near the incredible Snowdonia Mountain Range. The Cambridges reside in a five bedroomed farmhouse in a private location. 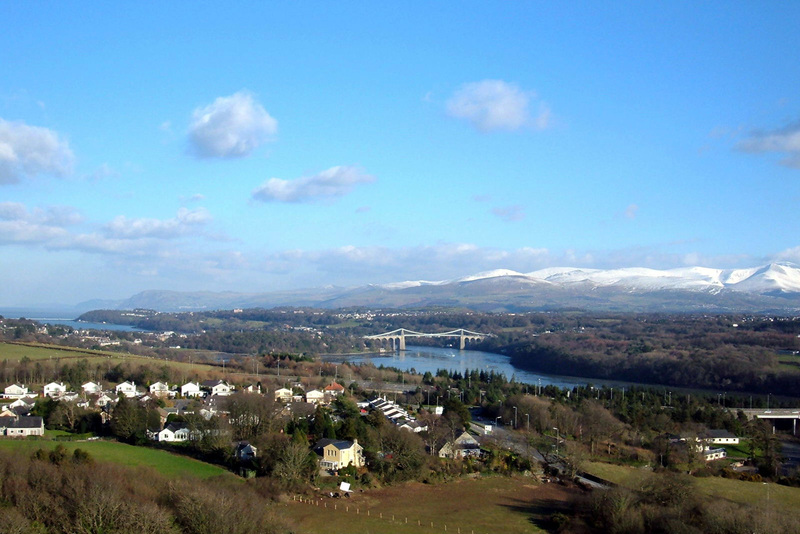 Interestingly Anglesey has the village with the longest name in Britain, Llanfairpwllgwyngyllgogerychwyrndrobwllllantysiliogogogoch. ( I'm not even going to attempt to pronounce it, What about you :)) When translated to English it means 'The Church of St. Mary in a hollow of white hazel near a rapid whirlpool and near St. Tysilo's church by the red cave'. Quite a mouthful indeed. 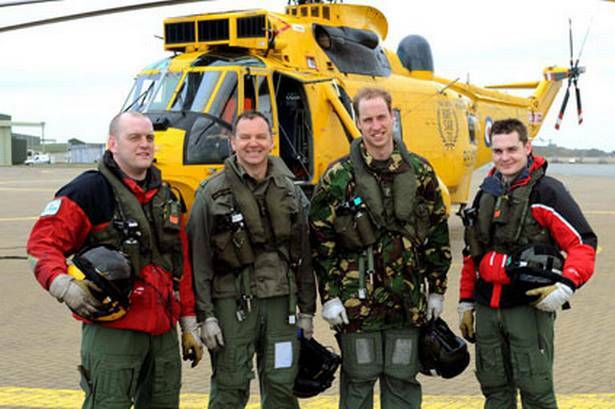 Prince William works as a search and rescue pilot at RAF Valley where he regularly works 24 hour shifts. The Prince is a very talented pilot and adores his work with the RAF, so much so that he hopes to extend his period of service with them. "Kate has very kindly baked cakes for the boys but unfortunately I wasn't on shift when they were made. So I'm hoping she'll come and make us some more. Apparently they were pretty good." Duchess Kate is regularly spotted stocking up on supplies at her local Tesco and Waitrose. A look at the main shopping street, quite a change from Kings Road near Kensington Palace. William and Kate nothing more than cosy nights in by the far with a takeaway and a dvd. 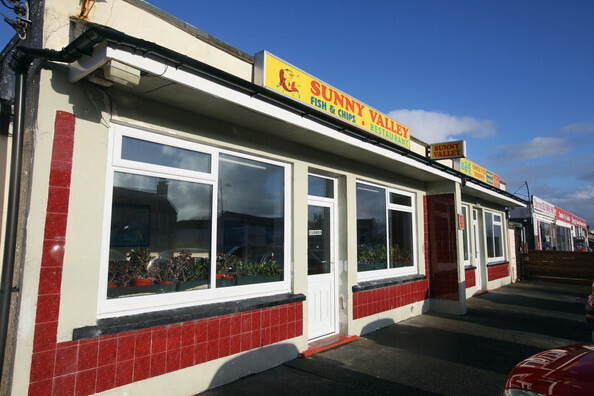 A look at the takeaway 'The Sunny Valley'. The couple sometimes enjoy lunch at The Seacroft. Located on the scenic Trearddur bay it is a place to relax, enjoy your meal and a drink whilst taking in the surroundings. 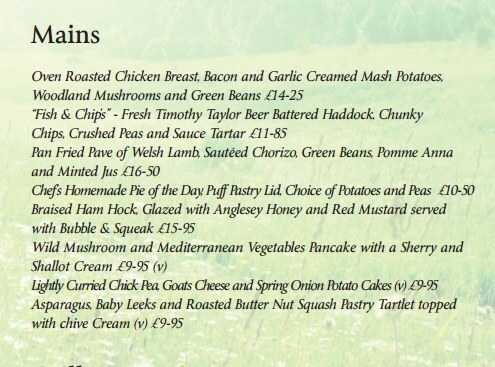 A look at the main course menu. I wonder what Will and Kate have? Speaking of Trearddur bay, A newly engaged William and Kate visited the Trearddur lifeboat station in February 2011 where they named the Atlantic 85 inshore lifeboat the 'Hereford Endeavour'. 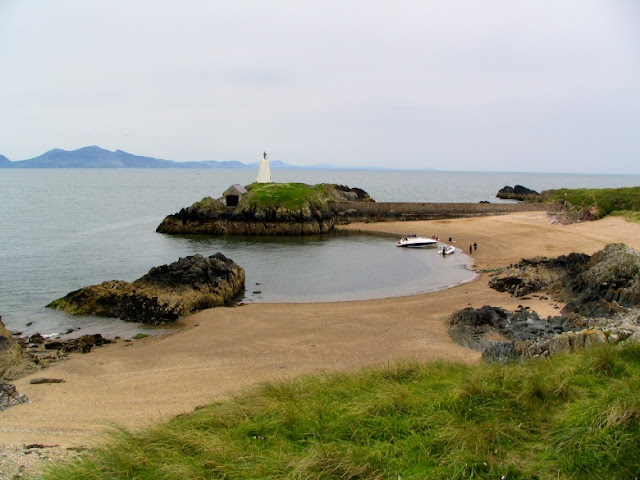 The Royals regularly enjoy a trip to their local Cineworld where they often avail of the 'Two tickets for the price of one' offer on Tuesday :) Kate loves going for a beach stroll with William and Lupo on Llanddwyn Island off the west coast of Anglesey. A closer look at Llandwyn Island. "I love our life in Anglesey. It's just nice to be outdoors and away from the city. As much as I love London, it's nice to get away". This article was a terrific idea! Thank you. 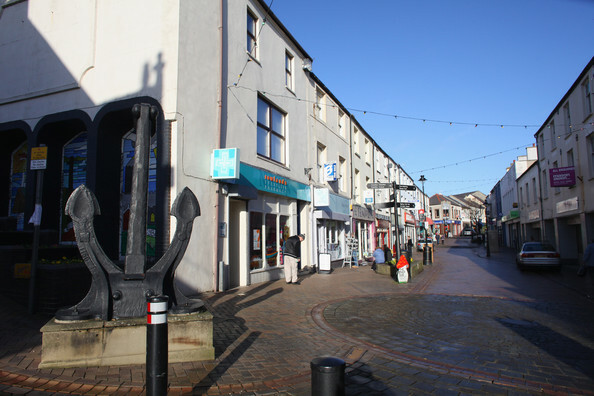 It seems like they have the best of both worlds...city life in London and a more quiet existence in Anglesey. You can just see why the both love it there. A place where they can live their life the way they want and William can protect his Duchess. Yes you do get pictures of them but not many. Wonder if William extends his stay in the RAF, if they will stay on Anglesey or go to Scotland like some of the media are saying. Let's just hope where ever they go the media leaves them alone. And maybe we will here some good news about a royal baby on teh way sometime soon, maybe after there busy schedule this summer. What a great place to bring up a baby, out of the way of the media. Thanks for the great page. Thank you *very* much for your comments. Quite a few people got in touch asking to see more posts in the 'Kate Loves' section and I thought Anglesey was a good idea as we know relatively little about it. It looks very tranquil and peaceful. I believe William is planning to extend his time in the RAF for another three years. It's wonderful that a good portion of the first couple of years of their married life will be here. It's a beautiful, peaceful place. I was thinking this, too. Married life can be HARD, and I can't imagine how much harder it must be to live in the public eye like they do. At least they get some breaks from the paparazzi while they're in Wales. I like the idea about "what Kate loves section". There is alot you can put in there, William, clothes, shoes, Lupo ect. I love hearing about William & his Duchess. Those two are so beautiful together that we Kate lovers can not get enough. I also like the idea of William staying in the RAF. It will give them more time together and when they have a baby, they will not be so much in the spot light. We all know that when the Duchess does get pregnant, William is really going to be very protective of his Ducehss. Maybe like I said before they will go to Scotland or just stay in Wales (Anglesey). But where ever they go, the media will try to follow...lol As much as I love seeing pictures of the Duchess & her Prince I do feel sorry for them. I feel that if they are doing engagements for their charities,then pictures are ok. But when they are just being a married couple out walking, going to the movies or when Kate goes shopping, etc then it should be off limits. Can you just imagine when they do have a baby what the press is going to do to them. I would be scared to death. But we know William will do everything in his power to protect his Duchess & child. Just found your blog and am enjoying it! Thanks for putting all this together! Interestingly Kate was spotted in Waitrose, Kings Road today. Surprised she's not in Anglesey at the moment. Maybe her Prince was with her or that he is on one of his 24 hour shifts. When he is on those shifts, he has to say on base. No pictures???? Isn't Waitrose a grocery store? Just one more week before we get to see the beautiful Duchess & her Prince together. Can't wait. Keep up the great work and thank you for all the time you put into this blog to keep all of us up to date. Thanks for giving us a tour of the Cambridge's home town. I'd love to think that they could just pop into a cafe or shop and be greeted and treated just like every other customer. So sweet of Kate to bake cupcakes for the crew. @ Lee I am with you. 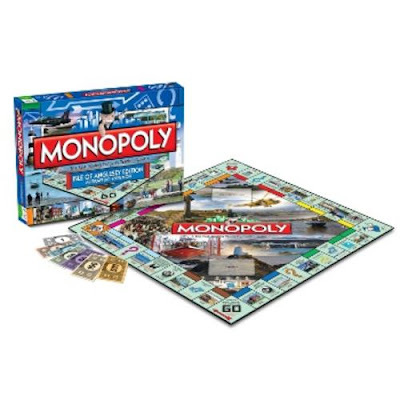 Does anyone out there know what the travel time is between Anglesey and London? And we will not know what form of transportation the duchess takes between the two places because of secuity reasons. I don't know about any other Duchess fans, but I am having withdrawals. It has been to long since we have seen the beautiful Duchess and her Prince together. Ya we did see them skiing but it is not the same when you get to see their faces and the way they look at each other. Just the love in their eyes when they look at each other. Well we only have about 8 days before they will be together again in public. Can't wait. and hours in the car!! Thank you for your very informative reply Anonymous. @Anonymous, thank you for the information. Now we should think that the beautiful Duchess would take a helicopter ride to London, I would think this way for secuity reasons. But if William is with his Duchess and they plan on being there for a few days then maybe by car but maybe not. Well Duchess fans we only have 7 days before we should see the Duchess & her Prince together again. I can't wait. Hi!! I'm Italian and a lot of newspaper in those days said that Kate is faint when she was in public ... I think that this is a false new, isnt't it? I enjoy your posts. This was so interesting. What a beautiful place to live. Sue - Thank you, I'm *delighted* you enjoyed the blog! Monica - I do believe those reports are false, Kate seems to be in fantastic health! 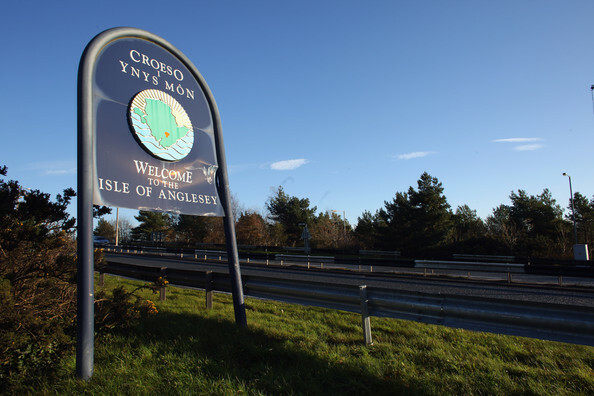 Anglesey looks like such a beautiful place, somewhere you can go and forget your worrys and relax. You are very lucky to have found someone like William. I especially like hearing about the charity work you for in honour of Henry Van Straubenze. He was very good friends with my brother Edward at school before he was sadly killed 5 years ago working in Sierra Leone. You are a true admiration Kate. This is a blog with Kate, we don't have any affiliation with her but thank you so much for your lovely comment.